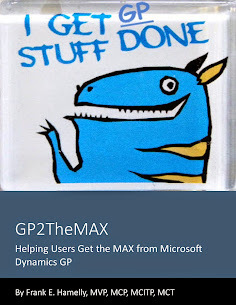 I've seen a lot of activity recently on the Dynamics GP Forum, indicating confusion over what version of SharePoint works with the new GP Workflow 1.0 and 2.0. Quick answer - none of them. 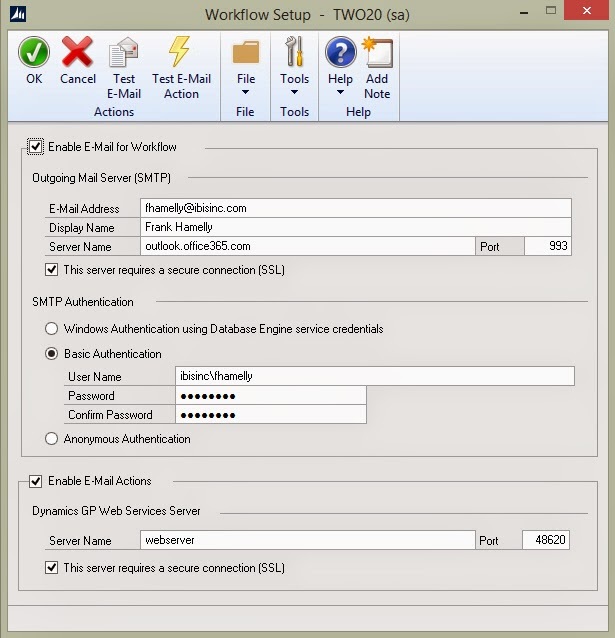 GP 2013 R2 and GP 2015 both have a native workflow engine built in, eliminating the need for SharePoint altogether. Additionally, Reviewers and Approvers need not be GP users to Review and Approve workflow steps if Email Actions is enabled. Approval can be initiated from within email notifications generated by the workflow. Considering an Upgrade from Dynamics GP to Dynamics AX? Recently I’ve delivered Dynamics GP training to new users who came from a company using Dynamics AX. 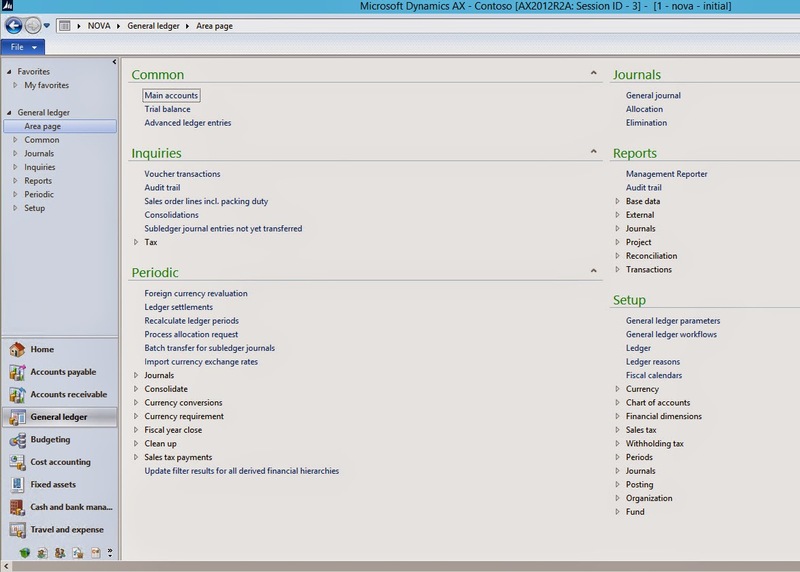 In my own experience, other than the additional features that Dynamics AX offers over Dynamics GP (which are considerable) and getting accustomed to the ability to post a transaction initiated in the General Ledger back to a subsidiary module in AX, there is a lot of commonality in the User Interface (UI) between the two applications. This is particularly important for companies that have perhaps outgrown Dynamics GP and are considering a move to a more full-featured ERP system such as AX. Microsoft has done a commendable job of unifying their ERP system UI’s, which offers the client the benefit of quicker and easier user adoption when moving from one application to another. Additionally, both applications are tightly integrated with Microsoft Office tools, further easing the transition to a new system. 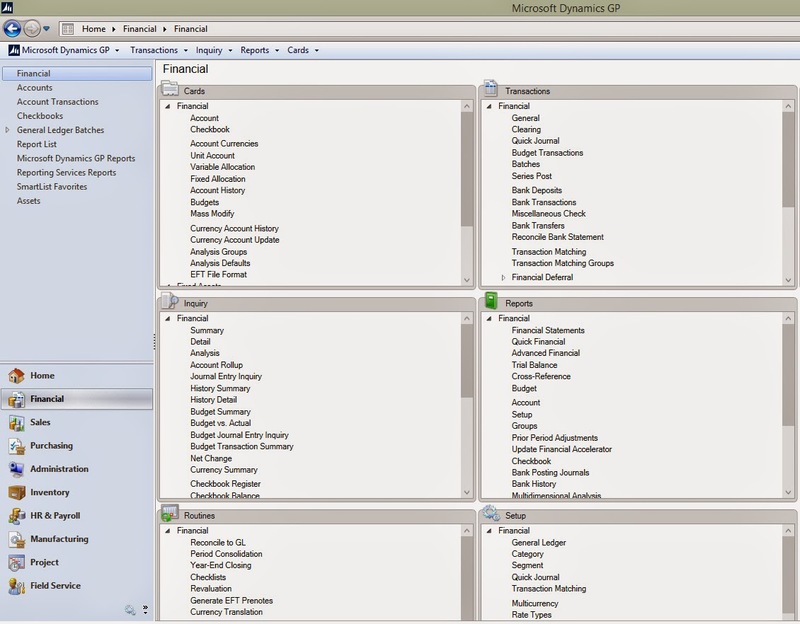 The first image below is of the Dynamics GP 2015 Financial module, with the menu items arranged in basically the same sequence as the Dynamics AX 2012 R3 image below it. Notice how the menus and the Navigation Pane layout are quite similar in both applications, albeit the AX UI is cleaner, in my opinion. Maybe the GP development team can get together with the AX dev team on that one. Based on their comments, my recent trainees report the same experience. They’ve indicated that adapting to Dynamics GP from AX has been much quicker than they thought it would be, primarily because of the similarities between the two UI’s. In considering an upgrade from Dynamics GP to Dynamics AX, user adoption and performance ramp-up can be relegated to the bottom of the list of concerns. I have a 3 week, all expenses paid vacation in Fargo, ND in January at the Microsoft offices, learning some of the finer points of Dynamics AX. As such, I thought I'd share some of the remarkable sights here. 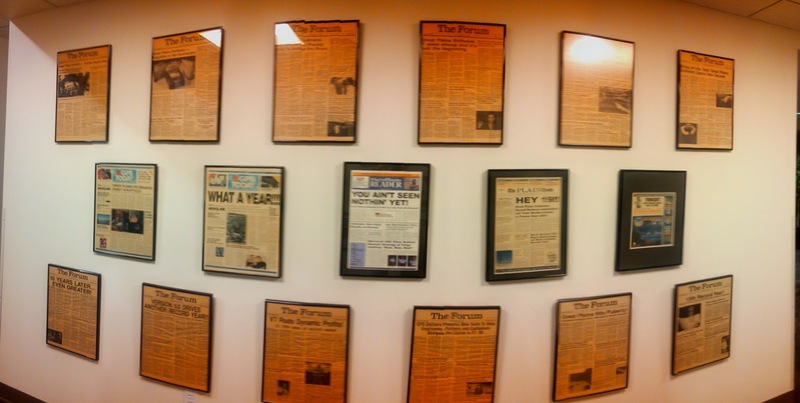 These two walls, in the hallway as you enter the Horizon Building from the Vista Building on the Microsoft Campus, display an interesting collection of news articles from the early days of Great Plains, up through when Microsoft bought the company in 2001. Pretty cool to take in the history of the application that so many of us have based careers on. One of the new features in GP 2013 R2 is the Microsoft ribbon command layout that we are familiar with in Microsoft Office products. It's kinda cool that this familiar interface is now part of Dynamics GP, even though it takes up more real estate in the window and takes some time to get used to as opposed to the previous icon shapes and positioning. However, the Ribbon button layout wreaks havoc with Integration Manager (IM). Because IM is at heart a collection of 'macros on steroids', essentially mimicking a user with really fast typing skills, the new button layout doesn't seem to conform completely with the IM Destination Adapters. The temporary resolution is to change the setting for the window layout in a new area in User Preferences called the 'Window Command Bar'. The default setting is 'Action Pane'. You need to set it to 'Menu Bar' to make IM play nicely with GP. After changing the setting, log out and back in to GP for the setting change to take affect. The errors I was seeing would not have led one to believe this could be the issue. I was getting two errors, regardless of which integration I tried - 'RPC Server Error' and 'Too many Forms Open'. However, these errors didn't occur until approximately 1,000 records had been successfully imported, then the integration would fail at the same point every time. I initially suspected a data error or network time-out of some sort. After MANY hours of troubleshooting, I finally opened a support case with Microsoft and my friend Chris Bulson at Microsoft had the resolution to me within minutes. This is a known bug that Microsoft is working on the fix for. Hopefully this article prevents someone else needless hours wasted and head-scratching.